Congregation for Divine Worship and the Discipline of the Sacraments and for Institutes of Consecrated Life and societies of Apostolic Life. He has visited our community in Lourdes, France, on several different occasions, and has welcomed our invitation from our boys and girls to come visit us this year during the Festival of Life. He will be with us on Thursday July 12th, and Friday the 13th. 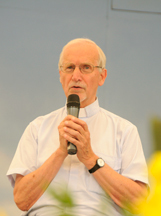 He will be at the head of opening mass during the festival on both Thursday and Friday afternoon. Bishop of the Diocese of Saluzzo where Community Cenacolo was born. He is the director of Vocations for the Episcopal Conference and for the Vocations and Seminaries for the “Mista” Commission for Consecrated life in “Piemonte.” He will be celebrating mass on Sunday morning which will conclude the Festival, during which he will ordain as priests Eugenio and Michel, the two Deacons of our community. Monsignor Balcells is the Archbishop of Tarragona, Spain. He was born on Febuary 8th, 1944 and studied at the Roman College of the Holy Cross between the years of 1962 and 1973 where he received a doctorate in Education. He later received a doctorate in theology at the University of Navarra, and became ordained an Opus Dei priest on August 5th, 1973. He has ministered with a particular interest in both teaching and faculty in Navarra as well as other locations, directing the Pastoral and Catechism Department at the University of Navarra as well as the Superior Institute of Religious Studies. On June 15th, 2004 Pope John Paul II appointed him as the Archbishop of Tarragona. 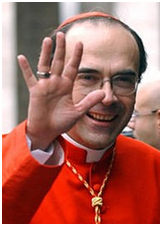 On September 19th, 2004 he was consecrated as Bishop, officially taking possession of the Archdiocese. On June 29th, 2005 he received a pallium from Pope Benedict XVI at St. Peter’s Basilica in Rome. He was also a member of the Commission for Seminaries and Universities in the Spanish Bishop’s Conference from 2005 to 2011. He has also been a member of the Teaching and Episcopal Commission for Catechesis since 2005. He has visited our Community in Lourdes on several different occasions. He has also invited many of our young people to give testimony in his diocese, searching to form a sincere friendship, and showing a deep interest in the faith-based journey of recovery that community has to offer. He will be with us on Saturday and Sunday to participate in the many moments of joy during the Festival. Father Francis is a Missionary of the Consulate. With the help of a few other missionary priests he helps run a monastery at Certosa di Pesio where monthly spiritual retreats are given as part of a “School of Prayer” for young people where the boys and girls of our Community also participate, in addition to meetings given for families, and catechisms and retreats for our consecrated. Father Francis has been a good friend of the community for years, and he often goes to celebrate mass, give catechisms, and hear confessions in a few of our fraternities. He will be giving the catechism on Saturday morning.